The fight for Mauerpark has a long history that began as soon as the Mauer was torn down. City planners sought to use the area as a highway ramp for the Berlin Ring, to the north. Residents of the Gleim neighborhood and Oderberger Straße pushed for the establishment of a park: Mauerpark. There has been a great deal of progress since 1992, and, piece by piece, Mauerpark has come together. But it is still not finished. A variety of interests continue to clash with each other, and the completion of Mauerpark remains an unfulfilled promise. The association Freunde des Mauerparks has come together and evolved in these years of confrontation. The volunteer members oversee, among other things, the upkeep and completion of Mauerpark. The organization puts a special focus on the transparent involvement of citizens and a fair balance of interests. Grün Berlin, a service company operating under the Berlin Senate, announces the Senate’s decision not to complete Mauerpark as a 15-hectare park as planned in 1992, lacking the financial resources to acquire the neighboring land, owned by Deutsche Bahn. The first section of the existing park is to be renovated; the park will also be expanded by about 1.8 to the north of Gleim Tunnel, in the area of the Youth Farm. Citizens’ action groups are to be included in the planning process. Founding of Freundeskreis Mauerpark (Mauerpark Friends’ Circle). Beginning of intense political engagement of the Freundeskreis for the completion of Mauerpark, despite the Senate’s other ambitions, through an appeal sent to the then Berlin-Mitte Council Member for Construction Dorothee Dubrau. 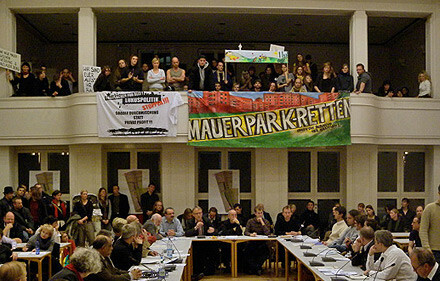 Introduction of an amendment to the Mauerpark zoning plan that would include residential development along the entire length of the park between Bernauer Straße and the tracks at Gesundbrunnen and a western expansion of the park by 30 meters, which would make for a 2-hectare expansion instead of the originally planned 5 hectares. Early public participation and planning. Concept for the renovation of the existing Mauerpark by the landscape architect Axel Klapka. Open interpretation of the change in the zoning plan, with opportunities for critique. Large-scale informational, protest, and signature-gathering campaigns against the planned construction next to Mauerpark organized by the Gleim Neighborhood Civic Association, Freundeskreis Mauerpark, Grünwerkstatt Mitte, and other political initiatives. Collection and submission of thousands of signatures to Senator Hans Stimmann, responsible for urban development. Result: Stopping the planning process construction on the western edge of Mauerpark due to massive public objection. Mauerpark is ten years old. Beginning of the mediation process and the working group for alternative development options, with the participation of all relevant groups and authorities. Founding of Freunde des Mauerparks as an officially registered association (eingetragener Verein, or e.V.). The mediation process between Senate authorities, the District of Mitte, the park’s proprietors, and engaged citizens is aborted without concrete results due to disagreement on the question of future construction-free park spaces. Freunde des Mauerparks e.V. first establishes contact with Mitte Mayor Christian Hanke and District Councilmember for Urban Development Ephraim Gothe with a concrete vision for the completion of Mauerpark. Gothe’s version of the plan brings a new approach to the question of how a solution to the completion of the park might be possible without acquiring land. However, the property owners, Vivico, grant building rights on the area. Gothe’s design serves as a basis for negotiations with Vivico. Further urban construction plans from the Senate authorities, the Department of City Development, and the Senate’s architecture forum follow. All designs include construction of apartments along Mauerpark, essentially based on the rejected zoning plan. A new version from the Mitte Planning Office presents an expansion of the residential construction area on the area north of Gleim Tunnel, next to the children’s farm and, in exchange, a widening of the park in the area of the birch grove to the initially planned size as well as a narrow expansion to the north and west. This version shows an approximation of how a completed Mauerpark would look. Sale of the nationwide property of Vivico (previously fully owned by the German government) to the Austrian real estate company CA Immo AG. Negotiations with the new property owner, CA Immo AG, for a solution to the question of Mauerpark completion. Informational meeting with Councilmember Gothe. A new plan from CA Immo is presented, with a continuous row of apartments going north to south, similar to the plan from 2003 but with 4.5 more hectares of park, as well as a construction site north of Gleim Tunnel. Freunde des Mauerparks rejects this plan due to the problematic apartment construction on the southern end of Mauerpark and call for a completion of the park on the planned 5-hectare area. A new plan is proposed by the Mitte urban planning office with fewer apartments at the south of Mauerpark and commercial buildings on Bernauer Straße. According to this version, the park would grow nearly to its initially planned size, but a large number of apartments would be erected next to the birch grove and north of the Gleim Tunnel. Freunde des Mauerparks publishes a proposal that argues for the comprehensive completion of the park, but also allows for the possibility of the construction of socially mixed apartments exclusively north of the originally planned park area. The preservation of popular commercial activities, which date back to 2004—the flea market, outdoor restaurants, and a vegetable market—is an important element of the proposal. Presentation of the concept to the Mitte city development committee and consultation with professional planners. Decision by the Mitte Committee for Urban Development (SPD, Bündnis90/Grüne and FDP) to draw up a plan that would bring about the completion of Mauerpark along with the allowance of a partial construction on green and commercial spaces on the northern and southern edges of the park. By a wide majority, the Mitte Assembly votes for the completion of Mauerpark. Mitte’s Committee for Urban Development decides on a plan for Mauerpark from Bernauer Straße to Gesundbrunnen, with 4.5 hectares north of Gleim Tunnel allotted for construction. Allianz Environmental Foundation, which in 1993 supported the initial construction of Mauerpark with 4.5 million marks on the condition that it would be 10 hectares by 2010, gives the city more time to fulfill this requirement. The Bürgerwerkstatt (Citzens’ Working Group) for the Completion of Mauerpark commences; it consists of residents of the adjoining neighborhoods. The Bürgerwerkstatt is part of the Grün Berlin-run planning process for Mauerpark’s completion. It is funded by the budget of the senator for urban development and environment. Designs come from Prof. Gustav Lange, who has been responsible for the design of Mauerpark since 1992. Bürgerwerkstatt reports on the state of its work and appoints four speakers to the Urban Development Ideas Contest run by Vivico Real Estate, the land’s proprietor. The purpose of the competition is to attract proposals for residential construction in Mauerpark. The Bürgerwerkstatt lays out what it considers the essential guidelines to the eight architectural firms involved in the competition: No massive development in the north, if any; in the south only moderate development on the western edge of the expansion area; an ecologically and socially sound residential are, preferably with an auto-free zone in the north to adhere to the notion of a “Green Band” along the former Berlin Wall “death strip” and to ensure that the Moritzhof Youth Farm’s activities are not obstructed. The four spokespeople of the Bürgerwerkstatt leave the jury meeting of the Urban Design Ideas Competition that was convened to give the design award. The specified criteria of Vivico, which organizes the competition, have dominated the designs, but they are not consistent with the conciliatory criteria laid out by the Bürgerwerkstatt. The second-place design of the office of Prof. Lorenzen will be used later as a template for development plans. Preparation of the draft of Development Plan 1-64 ceases. In an act supported by the World Citizens’ Park Foundation, which seeks to purchase the park land through donations, Die Linke prevails over its coalition partner SPD to block further funds for the Bürgerwerkstatt. Until the election in October 2011, the Bürgerwerkstatt can only continue through the initiative of volunteer members, without the presence of the professional moderation team or landscape architect. The Bürgerwerkstatt presents a concept for the completed Mauerpark. Structured around the idea that from east to west and from south to north the park should go from loud to quiet (“laut – leise”), four areas of the park are defined: Event space (Pankow, or eastern, side); flea market, restaurant, and forum (southwest); a “line of dissimilar things” cutting through from south to north; and space for community projects (Wedding, northwest). Moving away from any plans for building south of Gleim Tunnel, the Mitte Assembly decides with a majority from SPD, CDU, and the Green Party, to continue with the planning process for the Wedding part of Mauerpark: in the north, an ecologically sound and socially mixed development with 25 meters between the construction side and the Pankow border. The “Green Band” will run through it, and a cold-air corridor and undisturbed activities of the Moritzhof Youth Farm are further essentials. State Secretary Christian Gaebler, senator for urban development and environment, announces that the purchase of land in the south for the planned expansion is out of the question. An about-face at the Berlin Social City meeting: The District Assembly decision from 4/19/2012 will be reversed due to a request from the SPD/CDU. A full development of the north is now the goal. A corresponding resolution from the Mitte Assembly does not come about. The Mitte District Office decides by executive fiat—without any involvement from the district parliament and the citizens—to continue with Development Plan 1-64. The Groth Group wants to acquire the area north of the tunnel on the Wedding side from CA Immo (previously Vivico) for residential construction. At the same time, an “Urban Development Contract” is worked out between CA Immo, the Berlin Senate, and the District of Mitte in secret negotiations. The Berlin Senate passes the Urban Development Contract; it will go into effect on December 20 through a so-called “Mauerpark Sale Contract.” The Groth Group is now the proprietor of the northern area, for the full development of 3.5 hectares. The commercial areas south of Gleim Tunnel remain with CA Immo. The Urban Development Contract is sold to the public as a “gift” to the citizens of Berlin, because in return for the granting of building rights to Groth Group (with a new construction plan, 1-64a VE, for the northern area), expansion of the park by 5 hectares in the south, plus 2 hectares of restaurants and flea market, can now take place. But it is a sham. In the contract, the State of Berlin is required to pay CA Immo nearly 6 million euros (3.82 million to CA Immo for lost rental income, 1.52 million for provisional upgrades to Gleim Tunnel, and about 600,000 to Groth Group for infrastructure and an access ramp. Significant complaints and lawsuits are expected. The contract is not, for the most, about making urban development designs more concrete; instead, it is little more than an official approval of trading away park space for development rights. The conflict between Mauerpark associations and local residents on one side and the Senate of Berlin and the Groth Group on the other escalates. The individual initiatives band together to form the Mauerpark Alliance (Mauerpark-Allianz). The Alliance stands decisively against development on Mauerpark, while Freunde des Mauerparks, among others, continue to see a moderate residential construction (on the basis of the approach adopted by the Mitte Assembly in April 2012) as acceptable. The Berlin Water Works announces that an underground storage tunnel with 7000 m­3 capacity is planned under Schwedter Straße between Bernauer Straße and Gleim Straße. It is part of the development of a necessary storage system to buffer the flow of sewage, and thus the spread of contamination, into Berlin’s waterways. Proposals for alternative locations by Freunde des Mauerparks, which would not have such a debilitating impact as the entrance areas of Mauerpark, have now been rejected by the Water Works. At a ceremony attended by then Senator for Urban Development (and later Berlin Mayor) Michael Müller, Allianz Environmental Foundation chair Lutz Spandau, local politicians, and Bürgerwerkstatt representatives, a 2-hectare section of the expansion area south of Gleim Tunnel is freed up for temporary use. The organization Mauergarten e.V. can cultivate a garden on a portion of this area. There is also now a link between Lortzingstraße and Max Schmeling Hall: for the first time since 1877, when the land belonged to Nordbahnhof, there is now a connection here between Wedding and Prenzlauer Berg for pedestrians and bikers. The spokesman for the Bürgerwerkstatt addresses the group with an appeal to the senator for the immediate full expansion of the park and reconsideration of the development in the north. The one-month review period for Building Plan 1-64a VE for the proposed construction area to the north of Gleim Tunnel begins. The Mauerpark Alliance submits 39,000 signatures objecting to Building Plan 1-64a VE. The District Office claims that it cannot publish an official count of the objections through Freunde des Mauerparks or its own official channels. At the meeting of the District Assembly it comes to light that the Council of Mayors has already decided to let the Senate take over the planning process. (The senator for urban development and environment will, however, continue evaluating the submitted objections.) This is a disenfranchisement of the parliament and further disavowal of citizens’ interests. The decision meets large protest from all Mauerpark initiatives and organizations.